Irishmen may not be stupid, but they certainly are sneaky! Do you think you are observant? Do you think you’ve got all the answers figured out? Because if you go to R U Smarter Than An Irishman?, you’ll likely find out just how wrong you can be! Paddy McCullagh has come to the Toronto Fringe to prove that Irishmen do not necessarily match the ‘stupidity’ stereotype that they are sometimes dubbed with. To challenge his wits, audiences must engage in a series of games and sleight of hand tricks, in order to determine just how smart this Irishman really is. Admittedly, I was not amazed by these skills, because I had seen many of these routines done in other shows in the past. The performance consisted of many tricks that you might witness at a magician’s show or in a street performance. However, it seems that McCullagh is not trying to impress you. Instead, he is trying to help viewers remember that some of the humour often comes in the simplest forms. This Irish Comedian has an easy banter that relaxes the crowd and transforms the theatre environment into a pleasant social evening amongst friends. Although the humourous content did not seem sophisticated when I arrived, its unpretentious simplicity did establish a comfortable community environment. By encouraging audience participation and lighthearted interaction, McCullagh created a show that is accessible for numerous age groups. The children ages 10 to 16 were laughing just as much as their parents and the older viewing audience. Although this production is primarily geared towards an older audience, it is a show that I would certainly consider bringing youth to as well. As McCullagh proves, looks can certainly be deceiving. 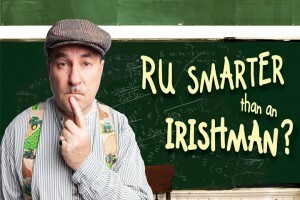 So, why not take a closer look at R U Smarter than an Irishman? It’s time to treat yourself to a pleasant evening filled with good laughs and new friends.